Dr. John S. Capps (left), president of Central Virginia Community College, and Dr. Kenneth R. Garren, president of University of Lynchburg, have signed a Dual Admission and Enrollment Agreement for high school students who know they want to attend LC after two years at CVCC. This enhanced agreement makes the transfer process even easier. “We want to be the very best partner we can be,” Dr. Garren said during a signing ceremony May 28 at CVCC. Dr. Capps responded that LC already is a great partner and that this agreement will help students achieve a high quality education at a more affordable rate. 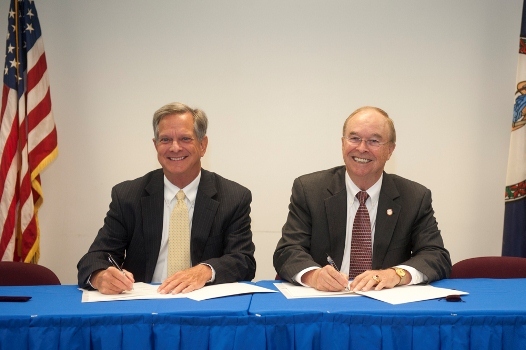 Studentsaccepted under this agreement will begin at CVCC in an Associate of Arts and Sciences (AA&S) or Associate of Science (AS) degree program. Upon completion of the academic requirements stipulated in the dual admission offer, a student will transfer to and complete the bachelor’s degree at University of Lynchburg. “The high school students are deciding much earlier that their destination is University of Lynchburg,” said Rita Detwiler, vice president for enrollment management at LC. The agreement comes with significant benefits, including the opportunity to have academic advising at both institutions beginning freshman year, and the chance to take one course per semester at LC while paying the CVCC tuition rate, Detwiler said. CVCC charges $122 per credit hour while LC charges $450 per credit hour for part-time students. Students admitted through the dual enrollment program will also have the opportunity to participate in selected events, clubs, and organizations at LC.